NEW YORK, NEW YORK – November 9th, 2017 – GameChange Solar today announced that landfill solar project development has seen a dramatic increase. This is because the cost to build projects has decreased and many state regulators have been increasingly favoring landfill and brownfield solar project developments since the repurposing of these otherwise valueless sites are especially beneficial to stakeholders and the community. 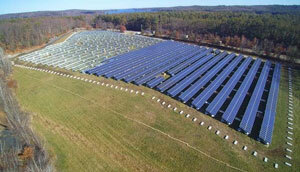 The decrease in cost is in much part due to the low price of GameChange Solar’s Pour-in-Place™ Ballasted Ground System. Significant expertise - The GameChange engineering department helps customers to avoid pitfalls, improve design, and provide documentation for regulators and other stakeholders to speed approval processes. Lower racking price - GameChange’s superior engineering and use of stronger steel than competitors enable longer spans and less foundations. Less concrete - Due to wider north to south spacing of the ballast blocks under the posts, less concrete is typically required to resist overturning wind load because the moment arm is longer. Faster installation - Innovative self-levelling technology effectively reduces labor costs. These factors combine to substantially reduce total project cost sometimes by as much as $.10 per watt lower in total versus competitive ballasted ground structure offerings. This has allowed landfill solar projects to narrow the cost gap compared to traditional non-landfill projects with pile driven systems installed on easy driving greenfield sites where foundations can penetrate. When low cost is combined with superior economic incentives or even with no beneficial incentives, ballasted ground solar projects are consistently obtaining superior IRRs when the GameChange Pour-in-Place™ Ballasted Ground system is utilized. Derick Botha, Senior VP of Business Development for GameChange Solar, stated: “The GameChange Pour-in-Place Ballasted Ground System continues to be a major technology breakthrough. Its continued refinement and rapid cost reduction have made the system become the clear structure leader in the landfill and brownfield solar market. We have also seen the system being adopted rapidly for use on rocky sites where drilling and using screws or piles with concrete are not cost effective or dependable alternatives. In addition, we are seeing overwhelming demand for the system in the international market."